I have made three batches of these vegan Bakewell tarts this week as I originally planned to make them raw and gluten free but this didn’t satisfy my Bakewell tart craving enough so then I went for a gluten free version which worked well but as I’m not actually gluten free I also decided to make a non gluten free version which were so good!! The gluten free version also worked well and I will be sharing the recipe for those later in the week. 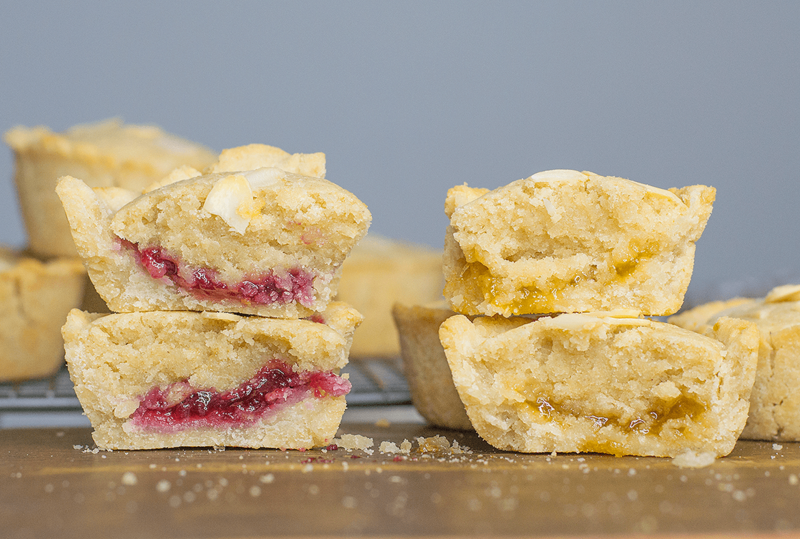 But back to this vegan Bakewell tart recipe! As I worked on the gluten free recipe first I actually used the same pastry as I preferred it, I used rice flour and it felt much lighter and crunchier than normal wheat flour pastry. You can easily switch the rice flour for wheat flour though. I am going to be using it for some vegan rhubarb and custard tarts later this week so make sure you’re subscribed to receive a notification for that recipe, if you like the sound of it as much as me that is! I made these apricot and raspberry flavour but you could use any conserve you like, obviously cherry would work well too. 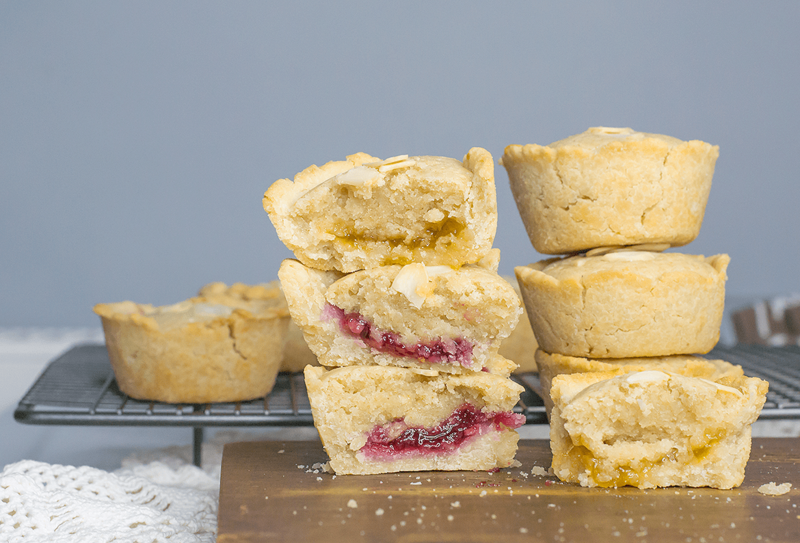 These vegan Bakewell tarts were just so scrummy, they didn’t even last a day in our house. 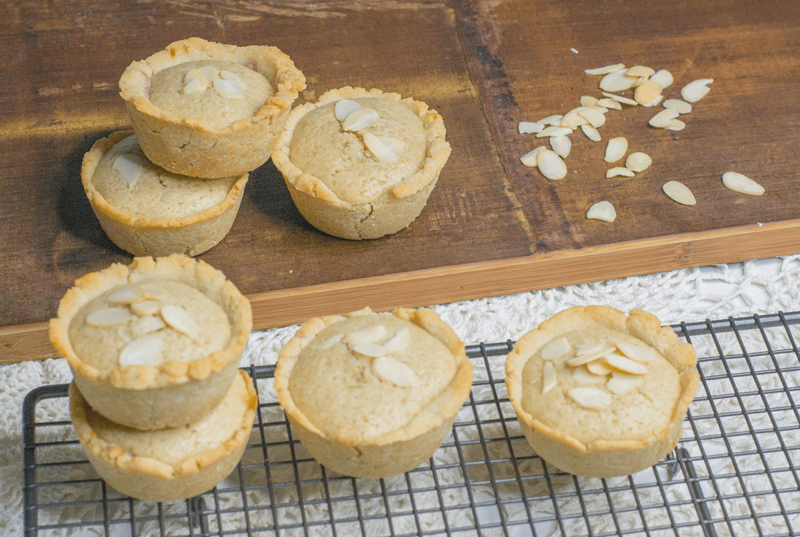 As I’ve mentioned before I am absolutely obsessed with Bakewell tart flavoured things (you can find my Bakewell tart rice pudding pot recipe here) so I thought it was about time I made some actual Bakewell tarts! I really wish I was about to eat one now, they would be really good heated up with dairy free cream, I used to love eating warm Bakewell tart with cream before I became vegan. They are equally good cold though, we took some out on a picnic with us. Rub the coconut oil into the rice flour and ground almonds. Add the maple syrup and slowly add the water until the dough can be formed into a ball. You might need a little bit more or less water. Divide the dough into 12 pieces. Oil a muffin tray then press a piece of the dough into each hole moulding it to fill the space. Put the flour, sugar, baking powder and ground almonds in a bowl. Add the dairy free milk, almond essence and oil then stir well. When the pastry cases are out of the oven place a tsp of the apricot and raspberry conserves into the bottom of each pastry case. Spoon the cake mixture into the pastry cases. Sprinkle a few flaked almonds on top. Bake for around 15 mins until the top feels firm when you press it. Leave to cool for a few mins before trying to lift them out the tray, this is so the pastry firms up. I find that gently twisting them first helps to unstick them before lifting out. I am using rice flour because I prefer the texture, it's lighter and crunchier than wheat pastry. The dough will be a lot more crumbly than wheat dough but it holds together once cooked. This means you don't have to cool or roll it out, you can just shape it into the holes. Obviously you can substitute it for wheat flour, if you do this you will need to cool the dough in the fridge for 30 mins then roll it out really thinly as it will rise slightly when cooked. It might also rise up in the tray so you might need to use baking beads for the blind bake. I find they are a lot harder to get out when using wheat flour too, so make sure to grease extra well. I love Bakewell tarts and haven’t been able to have one since going vegan. So excited to try this recipe!! I know! I love them too, hadn’t eaten one since before going vegan then decided to try and make them. Ended up eating so many since then!! They look beautiful! I’d love to try these on summer picnics. Bakewell is one of my favourite flavours. They went down a treat with my boyfriend and they are now going to be my holiday bake for the family! Yay! Glad he liked them, I can’t make them too often as I eat too many! What’s the best way to make these GF for a visitor? TIA! Thanks – because I bought rice flour for a GF guest, I just used that for the filling and it was fine, although a little dense. Another friend told me it’s best to use a combination of more than one type of GF flour for GF baking, but I didn’t see much need to do so for this recipe. Thanks for giving me a vegan treat for British expat to enjoy during the holidays! They tasted pretty Christmassy. Oh that’s good! No problem, you can’t beat a Bakewell Tart! !